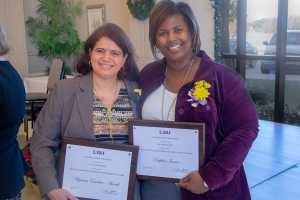 LSU Law Center’s Myriam Escobar-Aarabi and Daphne James were honored with the LSU Foundation Staff Outstanding Service Awards at a ceremony Dec. 3 in the Lod Cook Alumni Center. The awards recognize the superior work performance and outstanding contributions of full-time, non-academic staff employees of the LSU campus. Escobar-Aarabi is the Business Manager for LSU Law and oversees the Publications Institute department for student materials. James is the Associate Director of Admission for LSU Law. She is actively involved in the recruitment of new students to the Law Center and the disbursement of scholarship money, managing a budget of several million dollars in the form of tuition waivers and scholarships. “(Daphne) is the ultimate team player. She never fails to go above and beyond to benefit students, and always with a smile on her face,” Galligan said. “Several students have cited Daphne as the reason they chose the Law Center, and she maintains these important relationships long after graduation day. Congratulations, Myriam and Daphne, from the LSU Law Center!